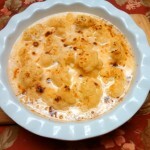 I am trying to get a jump start on comfort foods for fall and winter. Rice, potatoes, and pasta are creamy foods that lead my list. I actually try to balance menus with one of these carbohydrates. 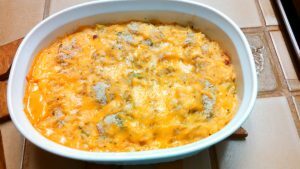 Broccoli Rice Cheese Casserole is also an excellent entree for a vegetarian meal. Using canned soup and frozen broccoli speeds up the cooking process. 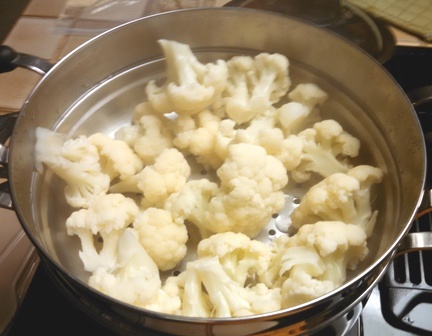 I have started to steam vegetables in the microwave. I put the chopped or diced vegetables in a small bowl, add 1-2 teaspoons water, depending on the amount of vegetables, cover with plastic wrap and steam for 1 minute. Occasionally I will have to add a minute. 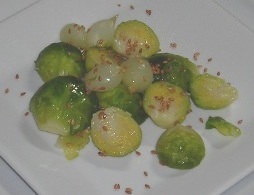 They are ready to be combined with other vegetables or meats and sauces. I do not add salt or oil to saute. 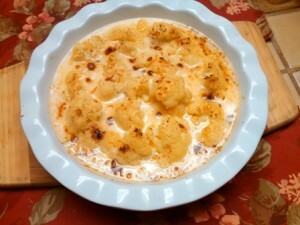 A good recipe to have for pitch-in dinners and a winter comfort food for week day dinner. Cook the long grain rice in the chicken broth until broth is absorbed. Cut and dice the onion, garlic, peppers. Put into a small microwave dish, add 1 teaspoon water. Microwave 1 minute or until onion is translucent. Steam the cut broccoli, just until crisp. 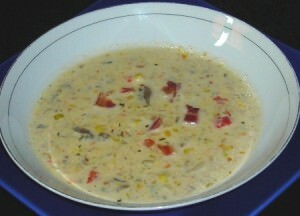 In a larger pan blend the Nacho soup and milk, cook until hot and bubbly. Add the broccoli, diced vegetables, and rice, stir to blend. Pout into a 9 x 9 x 2 casserole. 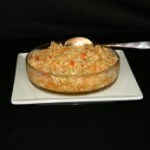 To make a 9 x 13 casserole, use 1 cup long grain rice and 2 cups chicken broth. 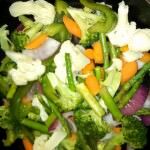 Adjust vegetable as desired......This was adapted from Campbell's Soup Kitchen..............Julia Ann and cookbookinabox® in partnership with Netta Belle’s Choice® brings you great recipes for your cooking experience. ©2007-2018 Netta Belle’s Choice® The Art of Gourmet Cookery® cookbookinabox® “Reg. U.S. Pat. & Trdmk. Off.” Reg. “Trade-marks Canadian Intellectual Property Office. “ Netta Belle’s Choice® The Art of Gourmet Cookery® cookbookinabox® All rights reserved. 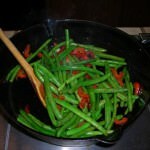 Use your favorite recipe for green beans: canned, frozen or fresh. Fix them by stir-frying, steaming. slow-cooker or in the pressure cooker, with or without ham. 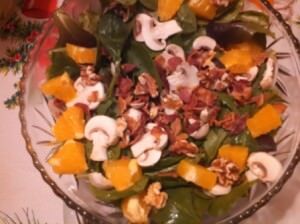 Try the Spinach-Romaine Lettuce Salad. 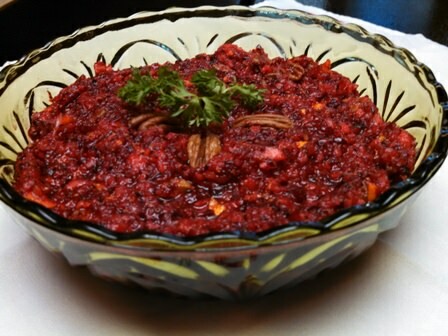 Enjoy and look for other cookbookinabox® recipes at www.cookbookinabox.com/blog. Julia Ann and cookbookinabox® in partnership with Netta Belle’s Choice® brings you great recipes for your cooking experience. ©2007-2018 Netta Belle’s Choice® The Art of Gourmet Cookery® cookbookinabox® “Reg. U.S. Pat. & Trdmk. Off.” Reg. “Trade-marks Canadian Intellectual Property Office. “Netta Belle’s Choice® The Art of Gourmet Cookery® cookbookinabox® . All rights reserved. 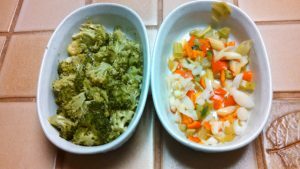 This entry was posted in Pasta and Rice Dishes, Vegetables & Side Dishes and tagged broccoli, cheese, entrees, nacho cheese, rice, vegetarian on September 2, 2016 by Julia Ann. They are both called pies, and are served in or on a crust. 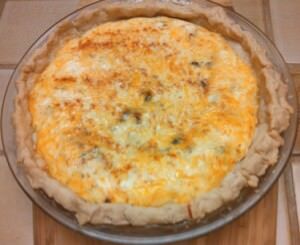 The quiche is a flaky pastry shell filled with an egg custard of cheese, meats and/or vegetables.. 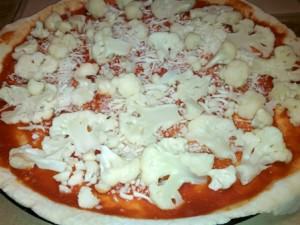 The pizza is a yeast dough crust for savory toppings, hot and spicy also of cheese, meats and/or vegetables. Introducing the Cheese-Bacon Quiche also referred to as a Quiche Lorraine. Quiche Lorriaine was first a custard base of few pieces of meat and poured into a hollowed out bread shell Now the delicious Cheese-Bacon Quiche is poured into a pastry shell. Some quiches have the meats, cheeses or vegetables on the bottom of the pastry shell with the egg custard poured on top. Quiches make a very good breakfast, brunch and small tart-like quiches make tasty appetizers or hors d/oeuvres. Savory pastry shells can be made by adding egg yolks or Parmesan cheese. The pastry for this particular quiche was made with coconut oil. Coconut oil does not have a flavor of coconut and the pastry is very flaky making it somewhat hard to handle getting into the pie plate. The flakiness of the pie dough adds texture to the custard filling. 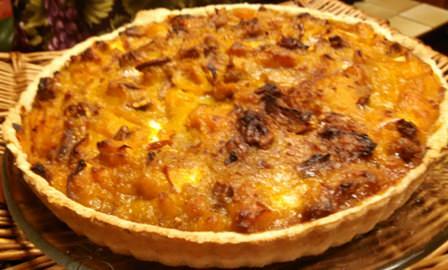 An egg custard filling with cheese, bacon and onion baked in a crust, a classic French recipe for Quiche Lorraine. Chill pie shell before filling. Remember to warm a glass pie plate before putting into hot oven. Fry the bacon in skillet until crisp. 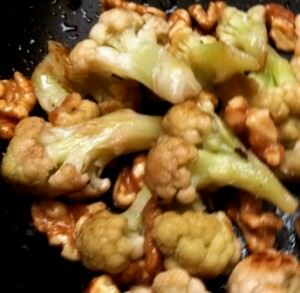 Remove from skillet, drain on toweling and crumble. Drain excess bacon grease from pan, save 1 teaspoon or enough to cook the onions until transparent. 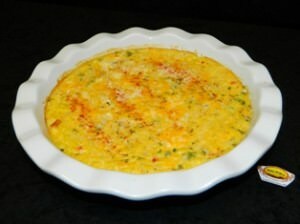 In a large bowl, combine milk, eggs, ¼ cup cheese, salt, pepper, sugar, nutmeg and hot sauce. Stir in the bacon and onion. Pour into the prepared pie shell. 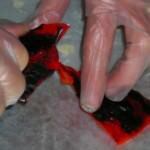 Bake 350 F for 35 minutes or until knife inserted in the middle comes out clean. 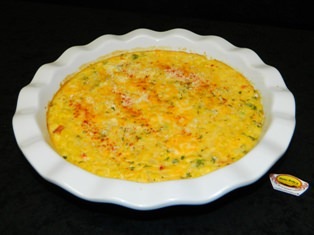 Cheese-Bacon Quiches served at a brunch could be made in to small pie like tarts, accompanied with bowls of fresh melon and mango and the Sour Cream Bundt Coffee Cake. 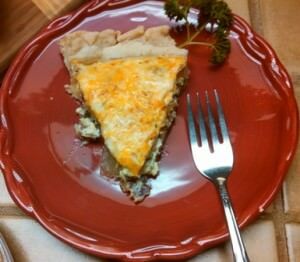 Lunchtime Cheese-Bacon Quiches would be enjoyed with a nice spring lettuce salad with oranges and pecans or tomatoes and green onions and walnuts. 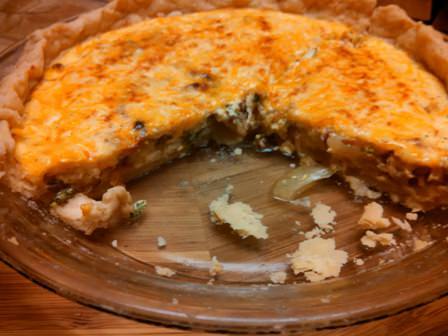 Think quiche for that extra appetizer for your next dinner. 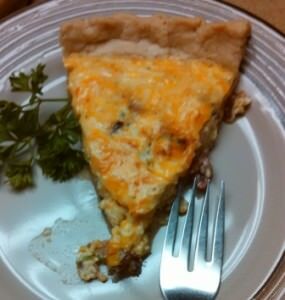 Other sources of quiche recipes. Julia Ann andcookbookinabox® in partnership with Netta Belle’s Choice® bring you great recipes, for your cooking experience. ©2007-2018 Netta Belle’s Choice® The Art of Gourmet Cookery® cookbookinabox® “Reg. U.S. Pat. & Trdmk. Off.” Reg. “Trade-marks Canadian Intellectual Property Office. “ Netta Belle’s Choice® The Art of Gourmet Cookery® cookbookinabox® All rights reserved. 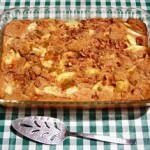 This entry was posted in Appetizers, Menus, Vegetables & Side Dishes and tagged appetizers, bacon, breakfast, brunch, cheese, eggs, Lorraine, onion, quiches on October 26, 2015 by Julia Ann. 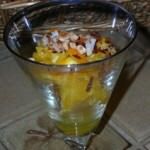 As summer is slipping away for another year and heading into the fall and winter months, the recipes are also changing. like the seasons. 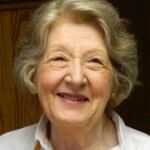 The comfort food of soups, casseroles of macaroni and cheese and crock-pot or slow cooker meals are plentiful. Do you have a favorite crock-pot recipe? 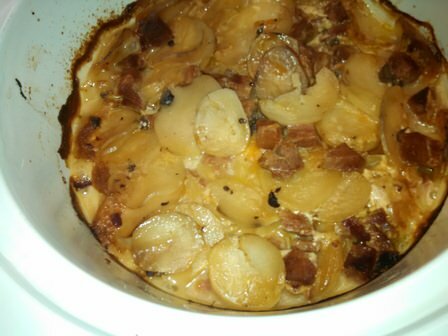 Crock-Pot Scalloped Potatoes and Ham was the right dish to take to a carry-in 3 hours away. 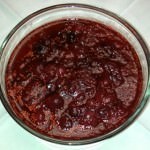 This recipe was inspired by Crock-Pot by Rival. 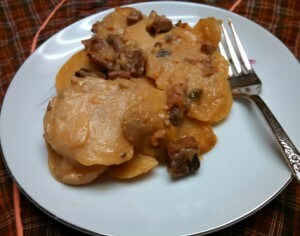 Country Scalloped Potatoes and Ham. My changes were additions such as garlic and onion powders, and 1/4 cup or less of jalapeno peppers. I also layered the potatoes, ham and cheese before adding the sauce. A recipe for a carry-in or pitch-in. 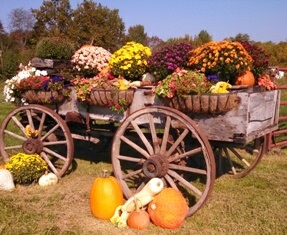 This carry-in was with my farm family. There was no lack of food, with bratwurst, fried chicken, hot dogs and hamburger, shredded pork, spaghetti and meatballs. chili, scalloped corn, baked beans, green bean casserole, all with a variety of finger foods, and salads. Oh the desserts! Pie, cake, brownies, and a favorite cookie, Buckeyes. Of course they were hit of chocolate and peanut butter. Richly seasoned potato and ham dish for making in the crock-pot or slow cooker. It could be the entree for a meal with ham, cheese, mushroom soup and potatoes. Whisk the gravy mix, onion and garlic powders, soup and water until well blended and smooth. Pour the blended gravy over the potatoes. Cover and cook on LOW 7 to 9 hours (HIGH: 3 to 4 hours). To with cheese last 30 minutes of cooking. cookbookinabox® “Reg. U.S. Pat. & Trdmk. Off.” Reg. “Trade-marks Canadian Intellectual Property Office. “Netta Belle’s Choice® The Art of Gourmet Cookery® cookbookinabox® . All rights reserved. Julia Ann andcookbookinabox® in partnership with Netta Belle’s Choice® bring you great recipes, for your cooking experience. 2007-2018 Netta Belle’s Choice® The Art of Gourmet Cookery® cookbookinabox® “Reg. U.S. Pat. & Trdmk. Off.” Reg. “Trade-marks Canadian Intellectual Property Office. “ Netta Belle’s Choice® The Art of Gourmet Cookery® cookbookinabox®. All rights reserved. 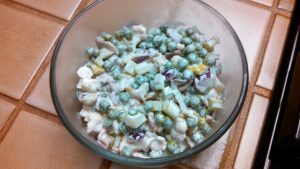 This entry was posted in Meats, Menus, Vegetables & Side Dishes and tagged brown gravy mix, ham, jalapenos, mushroom soup, potatoes, scalloped potatoes on September 29, 2015 by Julia Ann. 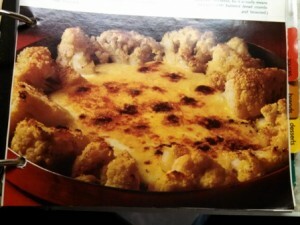 The recipe for Roasted Vegetables, Cheese & Crumb Topping is an adaption of a recipe I found on the internet. 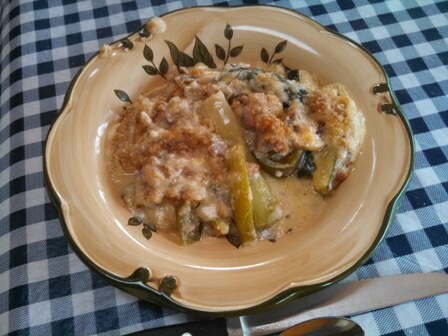 Thanks to The Cooking Coach of Amsterdam Private Tasting Tours for sharing her recipe of Roast Vegetable, Ham and Cheese Crumble. This winter it seems I have been into one dish dinners and of comfort foods for the family. 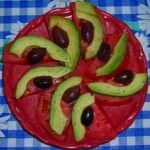 This is a perfect fit recipe with ample variety in choice of vegetables, meat or without meat, and cheese. We all have our favorite fruit crisps or streusels for dessert. This is a savory crumb topping to be used on other dishes such as chicken pot pie and green bean casserole. 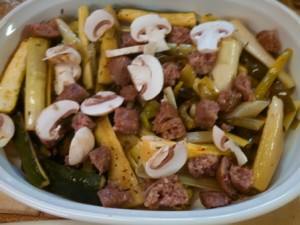 I used the vegetables available in my refrigerator: leeks, zucchini, yellow onion, and crimini mushrooms. Fresh sausage links were cut into bite sizes to dot over the top of the vegetables. 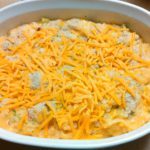 Vegetables and sausage topped with cheese sauce. 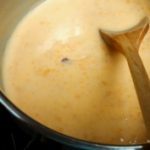 The cheese sauce was a combination of mild Colby jack cheese and Asiago Cheese. 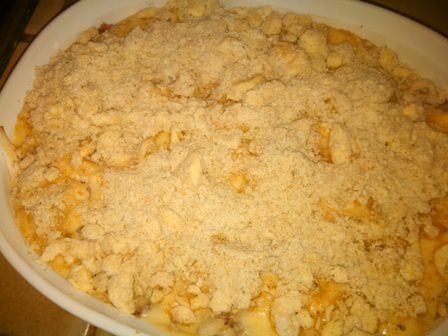 The crumb topping was of flour, butter and Asiago cheese. Before assembling, the sausage was cooked to remove extra fat, and the vegetables roasted at a high temperature to lightly brown and soften the vegetables. 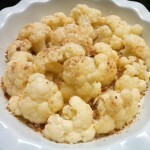 While roasting the vegetables, the crumb topping was made of flour, butter and seasoned with dried thyme, salt and pepper. 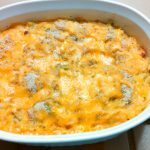 Savory blend of roasted vegetables with sausage, cheese sauce with a crumb topping of flour and cheese to make a one-dish dinner, just add salad. 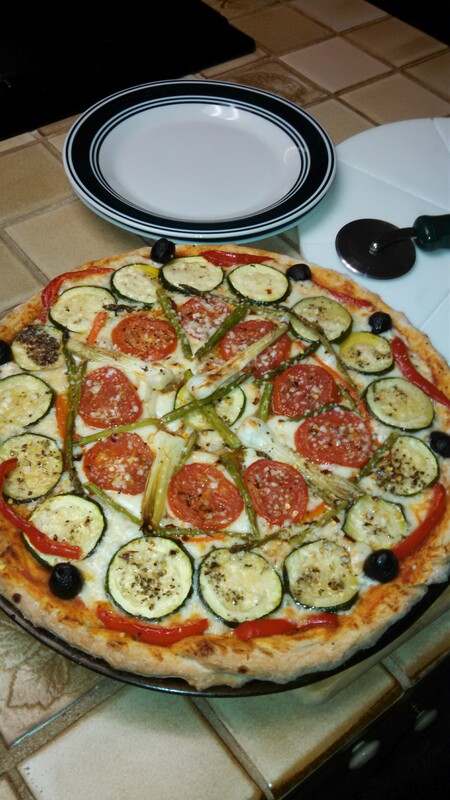 Cover baking tray with aluminum foil, spread out vegetables and drizzle with the olive oil, mix to coat with the oil. Bake for 15-20 minutes, or until browned and partially tender. Melt the butter in a heavy pan. Add the flour, stir with a whisk, it will be thick. Gradually add milk, whisking to smooth out the lumps. Cook over low heat about 2 minutes, stirring with wooden spoon. Add the cheeses to melt and stir occasionally. 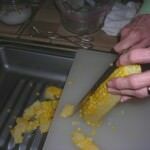 Grate in the butter or cut with pastry cutter until resembles course cornmeal. Stir in the cheese, thyme leaves black pepper and salt. Pour the roasted vegetables into a shallow oven proof dish. Spread the mushrooms and cooked sausage on top of vegetables. Pour the cheese sauce over the vegetables. Sprinkle the crumb topping over all. Add a sprinkling of cheese if desired. Bake 400 F 20 25-minutes until browned and bubbling..
Julia Ann and cookbookinabox® in partnership with Netta Belle’s Choice® bring you great recipes for your cooking experience. ©2007-2018 Netta Belle’s Choice® cookbookinabox®“Reg. U.S. Pat. & Trdmk.Off.” Reg. “Trade-marks Canadian Intellectual Property Office.” nettabelleschoice.com and cookbookinabox.com. All rights reserved. Now it is your salad choice with the Roasted Vegetables, Sausage, Cheese Crumb. Julia Ann and cookbookinabox® for your cooking experience. ©2007-2018 Netta Belle’s Choice® cookbookinabox® “Reg. U.S. Pat. & Trdmk.Off.”Reg. “Trade-marks Canadian Intellectual Property Office.”nettabelleschoice.com and cookbookinabox.com. All rights reserved. This entry was posted in Meats, Vegetables & Side Dishes and tagged Asiago Cheese, cheese sauce, crimini mushrooms, leeks, onion, roast vegetables, savory crumb topping, zucchini on May 1, 2015 by Julia Ann. At a local cooking class, once again I was kicked out of my usual thinking: pot pies have to have a pastry crust or puff pastry. Biscuits and refrigerated rolls out of a can are quick and easy toppings. I had never thought of cornbread. When do I bake cornbread? 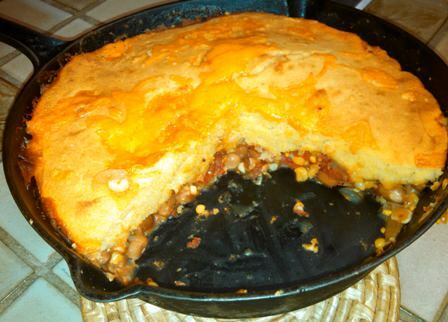 Usually when serving chili or soups there is a pan of cornbread. Now to be creative! What else goes with corn bread other than ham and beans. BEANS? 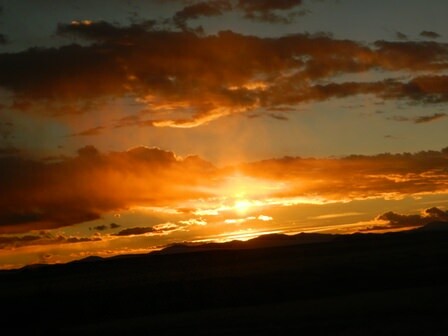 The west is a fascinating landscape, so colorful and different from the mid-west states. When- ever we drove out to Arizona, I always liked to stop at the Pueblo Indiana Cultural Center in Albuquerque, New Mexico to look in the shops, the museum and the Restaurant. The food was so good, but look out for the salsa. Hot!!! So here is my version of Southwest Vegetarian Pot Pie Recipe. 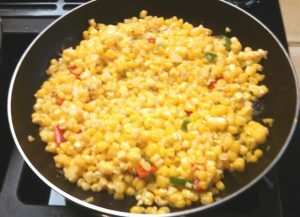 A blend of southwestern vegetables and seasoning with topping of corn bread, quick and easy to bake together for a one dish meal. Add onion, celery, red bell pepper, and garlic to softened. Add milk, egg and oil. Stir until just mixed, do not beat until smooth. 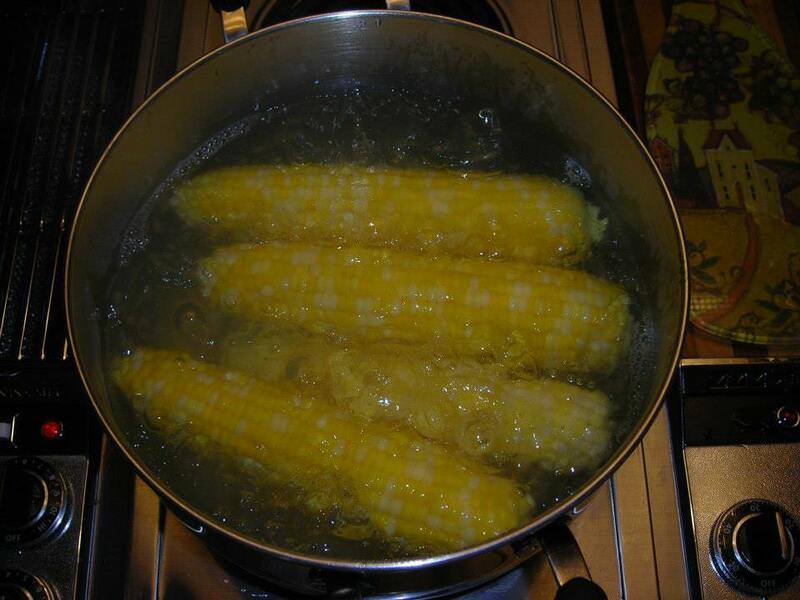 Pour over the bubbling vegetables in cast iron skillet (Or pour hot vegetables into greased casserole and cover with corn bread batter. Sprinkle shredded cheese on top, set in oven to melt cheese. Enjoy an evening dinner with Southwest Vegetarian Pot Pie. 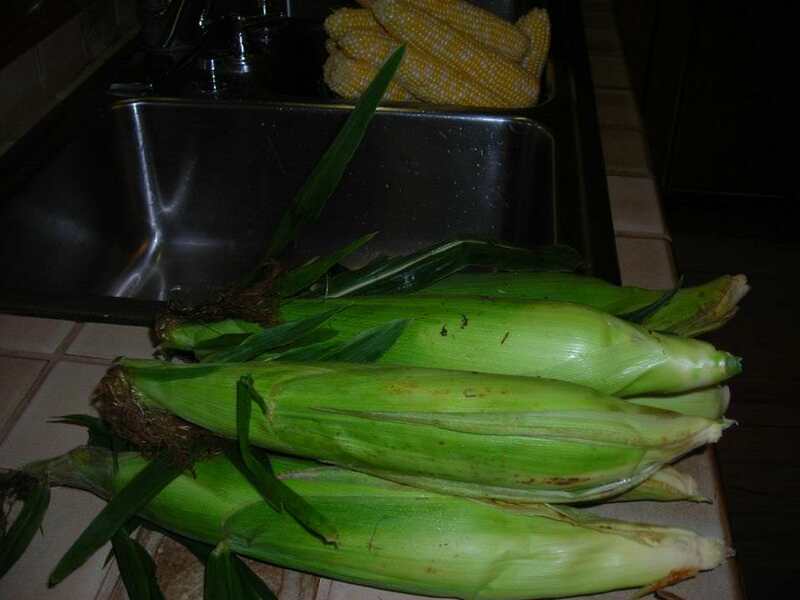 This entry was posted in Vegetables & Side Dishes and tagged beans, corn, cornbread, jalapenos, Pot Pie, southwest, tomatoes, vegetarian on October 13, 2014 by Julia Ann. Fall is in the air and the coloring of the leaves is happening… The beauty of the fall season is something to behold when the sun is shining. 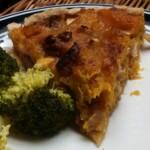 I have been given a couple of butternut squash to enjoy in older recipes and create a couple of new ones. This is back to a recipe I put up in October 2014. Still good! 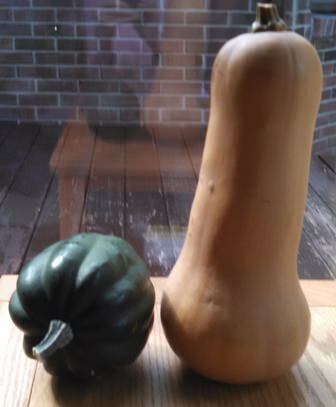 The butternut squash beauty on the right was selected for the autumn tart. The wonderful thing about this entree tart it is as tasty as eating dessert. 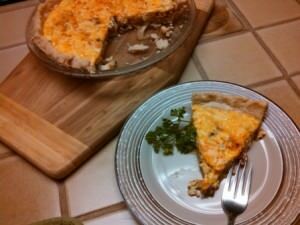 In this particular tart I used shredded chicken from chicken drumsticks previously cooked in the slow cooker. Drumsticks were tried as a means of trying to be economical. Chicken breasts are also very nice to use with this tart. Chicken was used this time as ham is not a part of this household’s diet anymore due to the high sodium and alas….extra fat. Butternut Squash, Chicken & Pecan Tart baked in a 12-inch tart pan. This make a wonderful tart with the ginger pastry. It will fill a 11-12 inch tart pan giving it a thick filling. 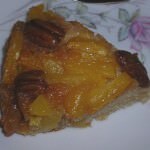 This was a perfect tart, it did not crumble when the tart pan rim was removed or crumble when it was cut. Just add a green salad or vegetable with fruit for dessert and lunch is served. 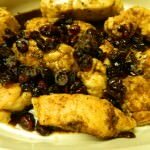 This recipe combines a favorite autumn vegetable with chicken, pecans and apples for a dessert like entree to become a Thanksgiving favorite. Adapted from Country Living Magazine, November 1998.----------------------------Julia Ann and cookbookinabox® in partnership with Netta Belle’s Choice® bring you great recipes for your cooking experience. ©2007-2018 Netta Belle’s Choice® cookbookinabox® “Reg. U.S. Pat. & Trdmk.Off.” Reg. “Trade-marks Canadian Intellectual Property Office.”nettabelleschoice.com and cookbookinabox.com. All rights reserved. 2018 Version of the Tart: I turned it into a 9-inch pie. I cheated and bought a frozen pie crust. I omitted the chicken, added just a little more squash, reduced the sugar some and proceeded as instructed. Really had more filling than needed. Baked the remainder in a small dish. Julia Ann and cookbookinabox® in partnership with Netta Belle’s Choice® brings you great recipes for your cooking experience. ©2007-2018 Netta Belle’s Choice®The Art of Gourmet Cookery® cookbookinabox® “Reg. U.S. Pat. & Trdmk. Off.” Reg. “Trade-marks Canadian Intellectual Property Office. “Netta Belle’s Choice®The Art of Gourmet Cookery® cookbookinabox® All rights reserved. 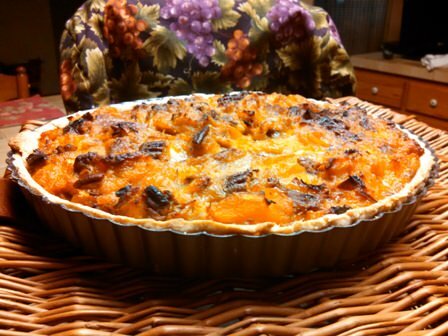 This entry was posted in How-To, Meats, Menus, Poultry, Vegetables & Side Dishes and tagged apples, butternut squash, chicken, ginger pastry, pecans, tart on October 8, 2014 by Julia Ann. Hamburgers and fries are easily gotten at fast foods. Frozen fries can be bought by the huge bags in the grocery. Wouldn’t you rather have home made French Fries? 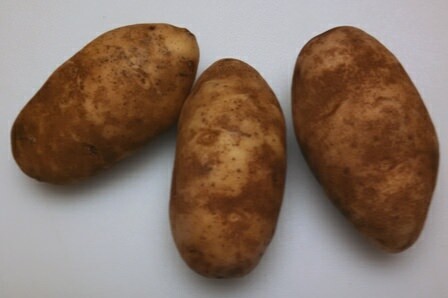 After peeling the potatoes, how do you prevent discoloration and keep crispness of the potatoes before frying? 1. dip potato strips in lemon juice. 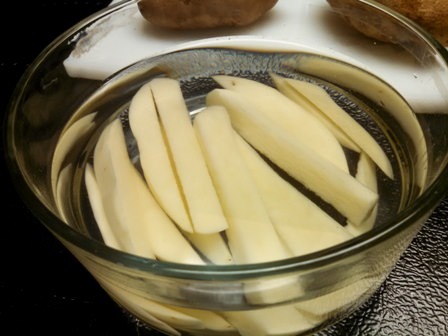 2. soak potato strips overnight in solution of half water and half vinegar. 3. soak potato strips in cold water for 30 minutes to 1 hour. I hope you chose number 3, soaking the potatoes strips in cold water at least 30 minutes will prevent discoloration and maintain the crispness. It also removes some of the starch. 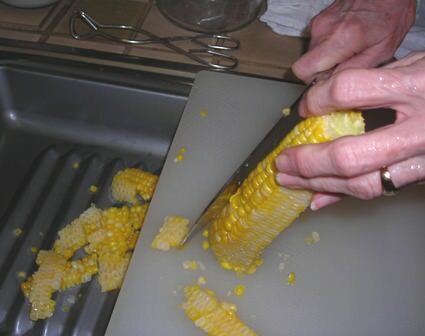 After soaking, drain and dry thoroughly before frying in the hot, deep fat. A test for doneness is the crispy outside and mealy on the inside and have turned a golden brown. When potatoes go into the hot oil/fat they will go to the bottom of the fryer. As they cook they will rise to the top of the oil and brown. Remove French Fries from the oil and put on toweling paper to absorb the excess oil. Season with sea salt or a seasoning or your choice to serve the hot fresh French Fries. Adapted from The Creative Cooking Course. The Creative Homemaker’s Academy, 1973.
cookbookinabox® in partnership with Netta Belle’s Choice® bring you great recipesfor your cooking experience. ©2007-2018 Netta Belle’s Choice® cookbookinabox® “Reg. U.S. Pat. & Trdmk.Off.” Reg. “Trade-marks Canadian Intellectual Property Office.” nettabelleschoice.com and cookbookinabox.com. All rights reserved. 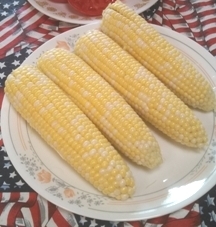 This entry was posted in Vegetables & Side Dishes and tagged French Fried Potatoes, French Fries, potatoes, russet potatoes on August 25, 2014 by Julia Ann. Netta Belle’s Choice for a budget meal. Have you ever had a week longer than your food in the house or the money in your wallet and pay day isn’t here yet? I thought I was through with those times forever. However! I am now retired. The pay isn’t as good as it was when I worked 40+ hrs a week for someone else. Well, this has been the dilemma in our house of two this week. It is amazing what new things can be cooked up with the same foods. I use leftovers and create new dishes which means I usually end up with more leftovers. 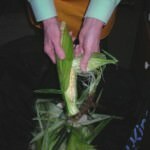 You may not relate, but I am sure many of your parents or grandparents can relate to using everything you have before getting new. Well, food does not really fall in that category – just left overs. I like to cook up several boneless, skinless chicken breasts with seasoned low-fat chicken broth or water in the slow cooker. 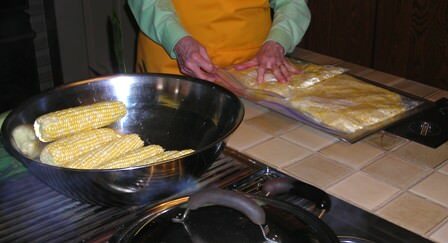 They can be bagged in freezer bags and pulled out only what is needed for a meal for two. Of course, I save the broth for soups in glass cans stored in the refrigerator. This time I had some ricotta cheese, some Colby Jack cheese and a green bell pepper. Oh yes, the cornbread from the day before. Luck would have it, I did not have an onion, hey, that is why the onion powder is on the shelf. Talk about need for comfort food! 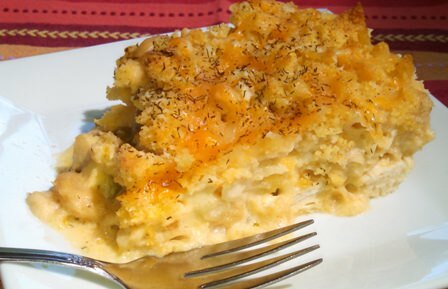 Well, here comes the macaroni, chicken and cheese. 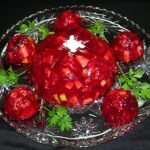 It was tasty, filling with a gelatin fruit salad and green beans and budget casserole. Not feeling too deprived, we had chocolate chip cookies and sherbet. For those budget strapped beginners in the world, couples, families, the retiree or just tightening the budget belt out of need, look at your leftovers and get creative. Here is one of my solutions. An easy on your pocketbook comfort dish for the family. It is one of those recipes, having leftovers is a good dilemma. ½ cup chicken breast, cooked and diced in ½ inch pieces. ½ cup green bell peppers, diced in ½ inch pieces. Grease a 9 x 9 casserole dish. Cook the macaroni in the water according to package directions. Drain the macaroni, do not rinse. Set aside. 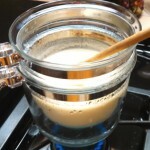 Warm the milk in microwave for 2 minutes, let set until ready to use. Use a large sauce pan to melt the butter to bubbling. Add seasonings, chicken breast and green pepper. Stir with a wooden spoon to blend together. Remove from heat, stir in the ricotta cheese and shredded Colby Jack cheese. Stir until the cheese has melted and sauce blended. Pour the cooked and drained macaroni into the cheese sauce, stir gently. Spread the crumbled cornbread evenly over the top. Sprinkle the shredded cheese over the cornbread. Sprinkle the dill week and paprika to your taste on top. Bake 30-35 minutes or until the sauce is bubbling and cheese is melted. 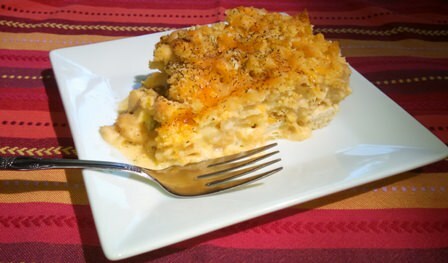 Macaroni, Chicken and Cheese Casserole – a budget comfort food dish. 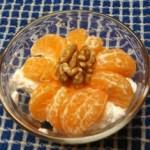 A simple salad of cottage cheese and Clementine orange. This was inspired by a recipe from Food.com Recipe #454932.
cookbookinabox® in partnership with Netta Belle’s Choice® bring you for your cooking experience. 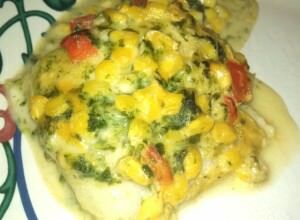 This entry was posted in Pasta and Rice, Poultry, Vegetables & Side Dishes and tagged cheese, chicken, Colby Jack cheese, comfort food, green pepper, macaroni, ricotta cheese on July 30, 2014 by Julia Ann. 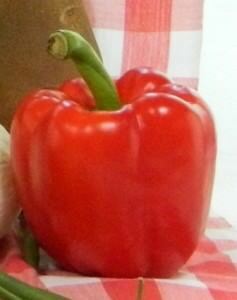 Ah, the stately red bell pepper! 8 years ago I discovered the art of roasting red bell peppers. Now they can usually be found in my freezer ready for use. While they make a good side dish, baked and seasoned with garlic, onion, oregano, balsamic vinegar and olive oil, roasted red bell peppers are good additions to many dishes along with garlic, onion, carrot and celery. 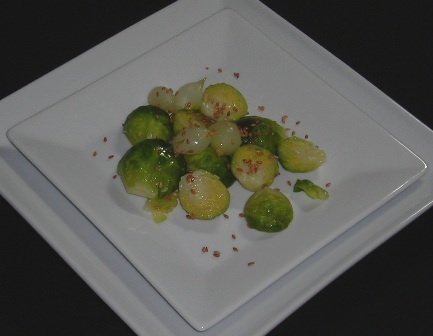 Since it has been roasted, it can be added to soups, salads, meat entrees, casseroles and vegetables later in cooking. Oh yes, don’t forget putting it on pizzas. These are not to be confused with chili peppers. The sweet bell peppers come in multiple colors from green, red, yellow, orange, purple, brown and black. The green and purple bell peppers are slightly bitter, None of the bell peppers are hot due to smaller amounts of capsaicin in them. All can be used to stuff and bake. When cut in half or cutting the tops off, they do make great little cups to stuff. Top of bell pepper is cut off to make ‘cups’ for stuffing. The white membrane is cut out for roasting. South and Central Americas were first known to have cultivated the bell peppers about 9000 years ago. Now they are raised throughout the world and used in many cuisines. In 2007, China was the largest producer commercially of the bell pepper. Florida and California are the largest commercial producing states in the U.S. New Mexico is the leader in the U.S. of commercially producing chili peppers. Cut red bell pepper open for roasting. 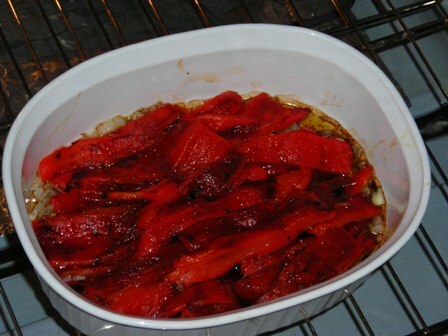 Peppers are spread open on foil-lined pan for roasting. Whether you buy your peppers in the grocery, open-air market or farmer’s market, select peppers which are firm, with green stems and heavy. Choose those free of blemishes, soft spots or dark areas. Not all green bell peppers turn red and some peppers never start out green. Just be sure the colors are deep and vivid and heavy for their size. Storage of bell peppers will keep 7-10 days in the refrigerator’s vegetable compartment. 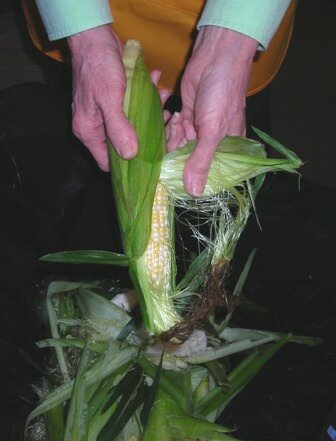 It is best not to cut the stem off prior to storage, although sometimes they are sold without the longer stem. To prevent moisture loss in the refrigerator storage, it is best to put a damp towel or towelling in the vegetable compartment to keep their moisture. 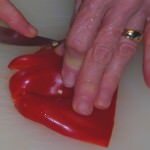 Bell peppers can be frozen without blanching, whole for stuffing or in pieces for adding to foods. 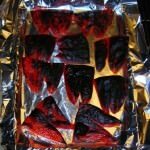 Roasting red bell peppers under the broiler for 15 minutes or until all blackened..
Blackened roasted red bell peppers ready for steaming. Sweet bell peppers are an excellent source of nutrients rich in an antioxidants and anti-inflammatory properties necessary to reduce the risk of chronic health disorders such as type 2 diabetes, cardiovascular disease and cancer. The vivid bright colors of red, orange and yellow are carotenoids which are the precursor to vitamin A. Remember being told to eat your carrots to help your eyes, yes vitamin A. Sweet bell peppers are excellent sources of vitamin C, vitamin A and vitamin B 6. 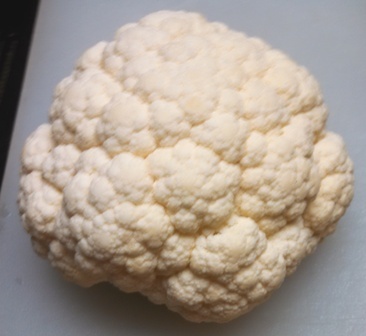 They are also very good source of fiber, vitamin E, K B 2, B 3 and potassium; they are low in fat. 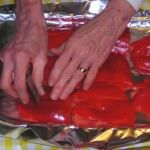 Cover roasted bell peppers with foil to steam 15 minutes. 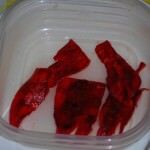 Peel skin off roasted peppers. Wearing gloves prevents staining of hands. 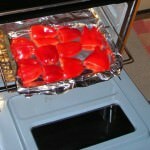 Roasted red bell peppers ready for cooking or freezing. Try roasting your sweet bell peppers, red, orange, yellow or even purple. They do add color to foods. Doing so is worth the time and effort and are not packed in oil. Besides that you get your vitamin A. Enjoy! 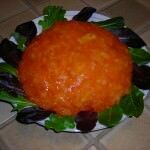 See my recipes: Red Bell Peppers Stuffed with Beans and Rice and Summer Time Coleslaw. 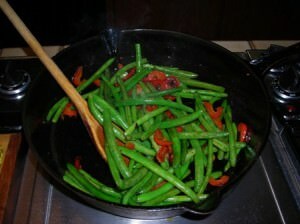 Informational Resource: The World’s Healthiest Foods, www.whfoods.org. cookbookinabox® in partnership with Netta Belle’s Choice® outstanding herbs and spices for your cooking experience. 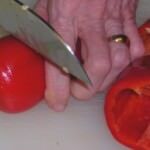 This entry was posted in How-To, Vegetables & Side Dishes and tagged bell peppers, peppers, red peppers, roasting peppers, sweet bell peppers on July 25, 2014 by Julia Ann. 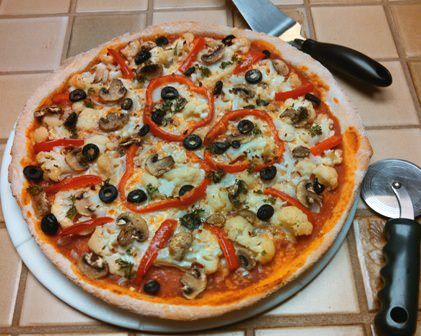 More and more recipes are for meatless Monday and for vegetarian meals. In the last few months vegetarian recipes are common at our mealtimes. I have 3 vegetarian cookbooks that give me new ideas. The food communities are an abundance source of recipes, menus and ideas. Peanut and Vegetable Linguine was a new recipe to try for our meatless Monday. 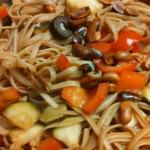 The Peanut and Vegetable Linguine was our dinner this last Monday. It turned out to be a winner. I followed the recipe exactly. However, as many of you find, a new recipe is created because you do not have the right ingredients. 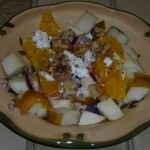 This recipe was changed from an oriental flair to a more Mediterranean cuisine. Pasta is thought to be of Mediterranean cuisine as well as fresh vegetables and nuts. This recipe uses whole grain linguine, a variety of vegetables sautéed in olive oil, topped off with black olives and roasted peanuts. Peanuts are a good source of vitamin B biotin, copper, manganese and vitamin E as well as providing the heart-healthy monounsaturated fat. As with all healthy diets, give consideration to the portion size and total calories. 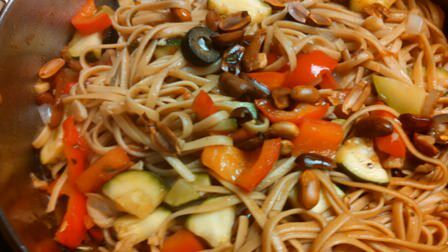 A recipe for a meatless Monday meal of healthy whole grain pasta, fresh vegetables and peanuts for a bit of Mediterranean cuisine. 1 Roma tomato, seeded and cut into ½ inch pieces. 1 small to medium zucchini cut into ½ inch pieces. Prepare linguine to the package instructions and drain well. Heat the 2 tablespoons of olive oil in a large skillet. Saute onion, garlic and ginger until softened. Add the chopped vegetables, cook over medium heat 10 minutes. 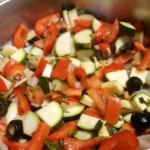 In a small bowl, prepare the dressing, adding all the dressing ingredients, except herbs and olives. Add the pasta to the vegetables. Pour the dressing, olives and herbs over pasta and vegetables. Toss together blend flavors; heat through. ©2007-2018 Netta Belle’s Choice® cookbookinabox® “Reg. U.S. Pat. & Reg. “Trade-marks Canadian Intellectual Property Office.” nettabelleschoice.com and cookbookinabox.com. All rights reserved. This entry was posted in Pasta and Rice, Vegetables & Side Dishes and tagged linguine, lunch, Mediterranean, pasta, peanuts, red peppers, vegetarian, zucchini on June 11, 2014 by Julia Ann. Spinach – Zucchini Quiche ready for baking. A colorful quiche with lots of vegetables spinach, zucchini, orange bell peppers and mushrooms. 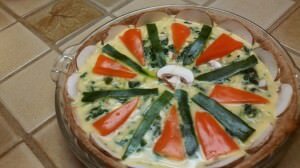 Spinach and Zucchini Quiche is a delightful luncheon main dish. It is adapted from a recipe from Nicholas Mosse an Irish tableware pottery company. I am trying to make more whole-wheat recipes for bread and pastry. I made a whole-wheat pie dough. It was not so delightful, it was tough! So back to the drawing board or use regular white all-purpose flour. There is whole-wheat pastry flour which I haven’t tried. 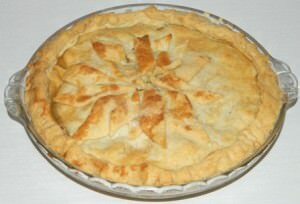 I recommend you to use your favorite one -crust pastry recipe for the Spinach and Zucchini Quiche 9-inch pie. Before pouring the filling into the single crust pie shell, it is best to partially bake first. To prevent the edges of the crust from collapsing, the bottom from puffing up or have a soggy bottom, fit aluminum foil into pie shell. Lightly oil the shiny side of the foil, gently put it into the pie shell pressing it up the sides, then add enough baking beads or dried beans on the foil to weight it down. An alternative to using foil and beads, set a lightly buttered pie plate, the same size, into the pie shell and weight it down. Bake in preheated 450ºF oven for about 15 minutes. After 5 minutes, if the sides of the dough has collapsed, it can be pushed up with a spatula. 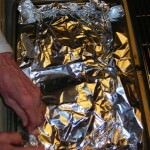 Remove the foil of beads or beans or pie plate, bake again for a few minutes to set the shell. It will separate a bit from the edges. Cool the pie shell before adding the filling. 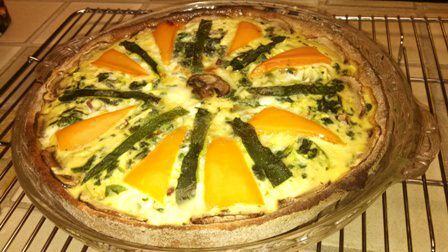 Enjoy a quiche of spinach, zucchini, bell peppers and mushrooms. 6 ounces of frozen chopped spinach, defrosted and squeezed very dry. Prepare the 9-inch pie shell. Thaw the spinach and squeeze dry. Peel and save strips of the zucchini skin. Mix spinach, grated zucchini and garlic together. Mix eggs and milk together. Put the vegetables into the cooled crust. Set the cream cheese into the center. Pour the egg mixture over vegetables and cheese. Arrange the zucchini peel and bell peppers into a petal shape on top and around cheese. 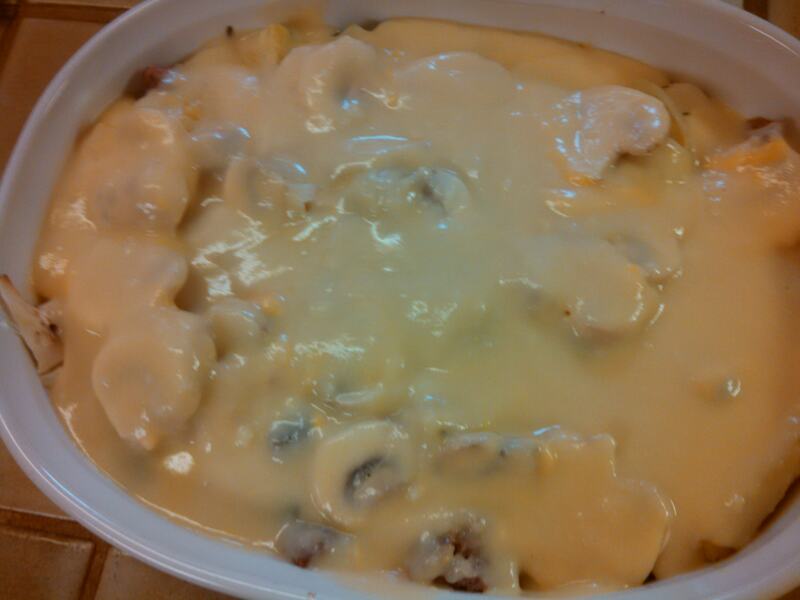 Insert the mushroom slices around the edge of the filling and one in the middle of the cheese. Add bits of butter on top of quiche. Bake for about 30 minutes, check to see if puffed up and it is done when knife inserted will come out clean. cookbookinabox® in partnership with Netta Belle’s Choice® bring you great recipes,for your cooking experience. 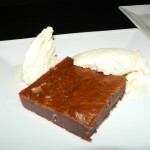 nettabelleschoice.com and cookbookinabox.com .All rights reserved. 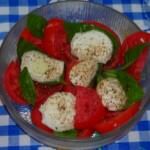 This entry was posted in Vegetables & Side Dishes on April 13, 2014 by Julia Ann.